As the Mersey Sound was slowly fading in 1965/6, it seemed that The Cavern Club was losing its relevance after closing its doors for a few months, due to the bankruptcy of Ray McFall in February 1966. But that was not the case – the club reopened in July 1966 and was world news again with Harold Wilson, the UK’s Prime Minister, officiating at the ceremony. Nevertheless, this phase of The Cavern’s history does not arouse much interest among scholars. For example, Spencer Leigh, who has written three books on the subject, only touches lightly on the years 1966-69, devoting less than thirty pages to the period. It is hardly fair that no one has taken more interest in the time when the charismatic Alf Geoghegan took command. And when his daughter Debbie came to the rescue! No, The Cavern did not enter a third incarnation in 1966 – quite the opposite. In the hands of another entrepreneur or corporate group that surely would have happened, but not with the good Alf at the helm. Alfred was the owner of Wilson’s, a small chain of Liverpool butchers, very popular among the locals. He was also blessed with abundant energy, a cheerful and kind character and a good eye for business. When he learned that the building owners were soliciting offers to take over the lease, Geoghegan got to work. First he consulted with his daughter, Debbie. But her opinion was a foregone conclusion, because she had been practically living in The Cavern since 1961. She often went to both daily sessions at the club, saw all the groups, had been a Beatles fan since they dressed in leather, knew the sets and, above all, understood what the regulars liked. Debbie immediately advised her father to take over the venue and he insisted that she help run the club. Debbie must have thought she was in seventh heaven. Work at The Cavern!? Alf, along with a partner, secured the lease for about £5,000, a very considerable sum in April 1966. The deal included use of the basements of numbers 8, 10 and 12 Mathew Street. In no. 8 was the original club, while the already empty no. 10 had housed Cavern Sound Studios (independent of the club and with all equipment removed) and in no. 12, behind a brick wall, was another dusty empty basement, not unlike the Cavern proper. All this space now had a rear exit to an alley that ran parallel to Mathew Street and linked to it. This is something that, without knowing for sure, Pop Thing has always claimed based on evidence that has drifted in over the years. With this expanded subterranean space at their disposal, Alf and his team undertook a renovation study that would respect the original club layout while including more leisure areas. In addition, there would be a wider entrance (actually, the old one was closed, but it was not altered at all) and modern electrical and sanitary facilities. What was inaugurated in July 1966 was the old club and much more: those of you who know the Tiles Club of London can get an idea of ​​the new Cavern – it had a cafeteria and bar serving simple meals, a clothing store, exhibition space, and areas to sit quietly and listen to records. And of course, it was still the same place where the groups played. Alf did not want to incur McFall’s mistakes. He always aimed for viability, he wanted the business to pay off while still maintaining its role as an internationally renowned cultural centre. And with Debbie as a guide, he got it 100%. Those five years of success are peppered with anecdotes. Debbie remembers everything because she was in the front line and wanted to pay homage to her father and claim his role in the club’s history. There was material for a good book. Debbie prepared it and Jorvik Press (Portland, Oregon) published it in 2016. 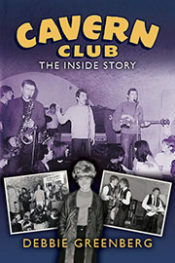 Cavern Club: The Inside Story (176 pages) is not just another of the many titles dedicated to The Cavern or Liverpool’s Mersey Beat. As mentioned, this is because it’s about an era for which there is very little information from reliable sources. That’s what stands out in Debbie’s book, the large amount of unpublished data and unknown everyday stories it contains. As it is well written and edited, the 176 pages flash by. It is hard to choose one revelation over another, but there are some very exciting ones: their tour of the closed club, lanterns in hand, with the newly acquired keys; the re-inauguration with the Prime Minister (and Rufus Thomas, Solomon Burke, Georgie Fame, The Searchers, The Merseys and a thousand others); the return of the good times (with Bob Wooler included! ); the presence of an organist who enlivened the kids that went to the cafeteria with his Hammond; Chuck Berry, sitting in a chauffeur-driven car parked in the middle of Mathew Street, demanding to be paid cash before going on stage; the relationship with Radio Caroline; performances by legendary artists Lee Dorsey, Edwin Star, Chris Farlowe, The Who in 1967, and an excited Paul McCartney (in 1968) and a thousand other things, all very interesting. If you got this far, it’s clear you’re interested in The Cavern and the Liverpool Pop Scene of the 60s, so this book will not disappoint you. It also contains many photographs rarely if ever seen. There is an excellent one of The Escorts! The book, which does not have a Spanish translation, can easily be found on Amazon. Extra Bonus Info: Debbie Geoghegan stopped working at the club when her father received a suitable offer for the business and decided to sell it in 1970. After marrying and working in other family businesses, Debbie divorced her first husband and married Nigel Greenberg, whom she had actually known most of her life because, quite by coincidence, he was one of the founding partners of Cavern Sound Limited, the recording studio that operated in the club between 1964 and 1966. Martin Craig wrote about the studio in a two-part article we published in 2010. 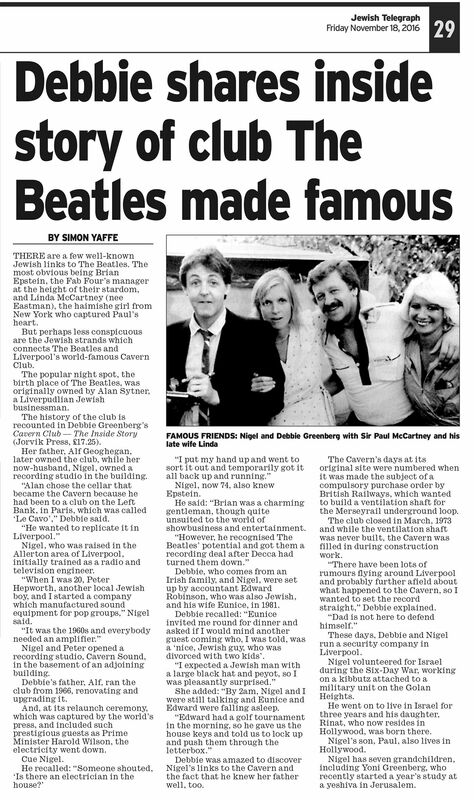 THERE are a few well-known Jewish links to The Beatles. The most obvious being Brian Epstein, the Fab Four’s manager at the height of their stardom, and Linda McCartney (nee Eastman), the haimishe girl from New York who captured Paul’s heart. But perhaps less conspicuous are the Jewish strands which connect The Beatles and Liverpool’s world-famous Cavern Club. As a teenager, Debbie Greenberg was spending far too much time at the Cavern Club in her hometown of Liverpool, England. It was already the most famous music club in the world, where she had been dazzled by the Beatles’ debut performance and witnessed their rise to stardom for two years before watching the local heroes leave home. Then in 1966, after the previous owner declared bankruptcy, her father asked out of the blue if she thought it would be a good idea to take over the club. It was an offer she couldn’t refuse. She’d been a Cavern fanatic since it was a jazz club, hardly missing a lunchtime or evening rock session until its closure a few weeks before – amid mass protests by Liverpool youth. Now she was suddenly part of a new family business, faced with the task of helping to breathe new life into a dilapidated rock ’n’ roll shrine and build on the legacy of the legendary Mersey Beat. This first-hand account of her ten years frequenting and eventually managing the original Cavern Club is the authentic inside story of the Beatles’ launch pad, full of triumphs and failures – and surprise celebrity encounters. Richly illustrated with dozens of photos, posters and press clips.